Newtown Artist Paul Forrest has the pleasure of hosting The Real Art Roadshow gallery in the school grounds. On show for your viewing pleasure are 70 great contemporary artworks by some of New Zealand’s legends of the art world. These include Buck Nin, Sir Toss Woolaston, Don Peebles, Rob McLeod, Jeffrey Harris, Elizabeth Thompson (A local from Newtown), and many more. Some to challenge you, some to delight you and some to blow your mind. “Our aim of this project is to engage, educate and inspire through the medium of visual art”. 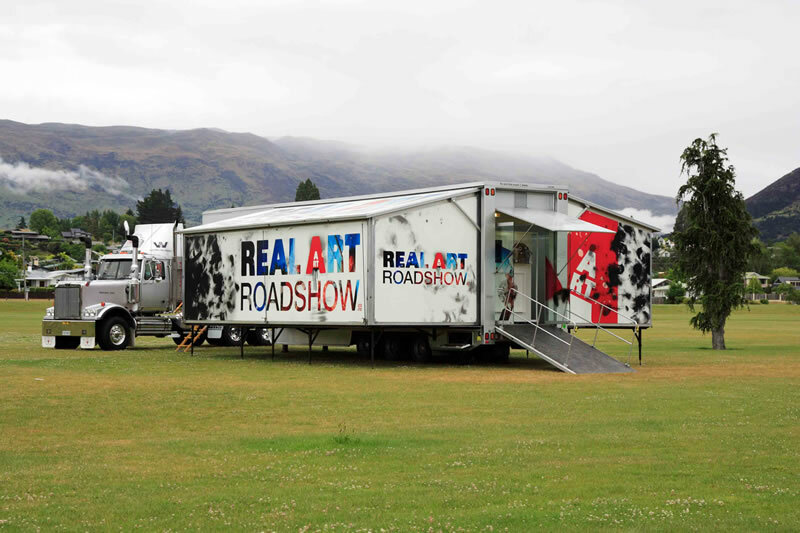 The Real Art Roadshow is a private art collection that has been touring schools all over New Zealand for the last 8 years and is on its final tour of the country. Now Newtown has this once in a lifetime opportunity to experience this great art collection and it’s free.